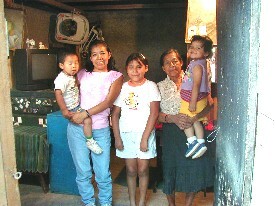 The Guatemala project began in March of 2000 with three goals in mind. To install concrete floors in the homes of people who have dirt floors, provide basic medication, and help people start small businesses to become self sufficient. Please look at the photos below and see the positive things being done. This lady had rented a home for years that was really a substandard dwelling. When she was approached about installing a concrete floor, it was discovered that this hard working lady had saved enough money to purchase a small lot to build a house on. 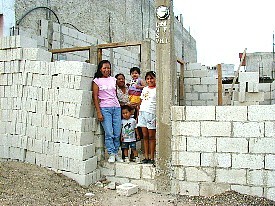 She was not able to save enough extra to go ahead and build a house of her own. So for only $400.00 an entire house is being built for her. Her new home is small but comfortable and clean. She no longer has to pay rent and this is helping her to get ahead financially. This young couple is getting a new concrete floor and an expansion to their small modest home. In order to support her family, this widow worked at a factory for extremely long hours and very low pays. 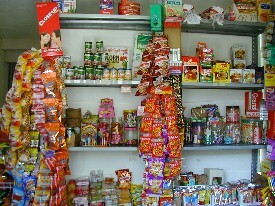 This forced her to be away from her children, but she had a dream of opening a convenience store of her own. She had already been preparing for this but lacked the funds to purchase her initial inventory, shelving, etc. For only $350 dollars she is up and running! She still needs some assistance with inventory as this business takes off, but she is carefully managing her funds and this business is growing and doing well. She is well on her way to financial freedom. In this area $800 was allocated for three concrete floors to be installed. The floors were installed and then with some of the extra money, a bread oven was built for them. These three families joined forces and they are now baking and selling bread to the people in their community. This is helping them to be self-sufficient so that they no longer require church assistance or charity for simple survival. Many people want to work and provide for themselves but just cant come up with the money on their own. Just a minimal amount of help from us is giving them the small edge they need to go forward and be successful. A concrete floor is currently being installed in this home. One person at a time, and one small step at a time, we are helping to make a difference in the lives of others.